Well The AWWE is on vacation but for the next week. I'm not. I'm sitting down with Ant right now discussing the AWWE. Ant: Well I need a break. My son's back in school and I just thought we should take a break before Summerslam. Ant: Yes Tom & Summerslam was our first live SVR09 big time PPV so this marks our 1st Anniversary of AWWE. Last year Christian came though he lost it marked a big moment. The Promo was one of the best in AWWE History. Nerdy Tom I remember all of that. Matter Of Fact I'm gonna talk about that card. Nerdy Tom: Melina won back her title from Candice. Bourne won vs Kofi. Orton took on Legendary Sabu for the 2nd time and won in a Falls Count Anywhere match. Taker won somewhat a handicap vs Mr.McMahon and Kane. HBK won his championship defense and as you spoke of earlier Christian arrived but lost. Is there anything you want to relive or stars you want to get back to for this anniversary. Ant: Yes I want to go back there again. I want Candice & Melina to get a shot at Summerslam. I want Sabu back in the title picture vs Christian at Summerslam. I want Bourne & Kofi to challenge The Miz. See I want the best of today vs the best of last year. Nerdy Tom:This is interesting. What about Main Events. The Undisputed Tag Championship etc? Ant: Well its quite simple but I can't speak on Undisputed yet cause when we return DX is taking on the McMahons in a Hell In A Cell match for the belts. As for WCW I'm bringing back Chuck, ECW Swagger and Dreamer get a shot vs Muta, AWWE World Heavyweight Championship will feature the toughest past champions in a 6 Man Battle Royal for the championship. I'm talking Edge, Jeff hardy, Giant Bernard, Kane, Orton. As for World Heavyweight well Cena, MVP, & Big Show would be great in the ring with Batista. Nerdy Tom: Man I can't wait I'm sure the fans can't wait anything else you would like to discuss. Ant: Well our next gamesave for SVR09 is out. Check gamesaves for that. Also, You're gonna be updating the site alot next week for the return of AWWE which might come sooner than what I'm currently stating. AWWE Schedule will change it will be done more randomly with my busy schedule causing me to do 2 shows sometimes on one day. Get the Gamesave. Check out my antdagamer.blogspot.com. Last but not least make sure you check out the pics and scans in our SVR10 coverage on the site. Nerdy Tom: Thanks for that info. One more question are you done from being in the ring. Ant: Well I have one more proposition for Corp this has been going on for awhile. Its time for the AWWE to move on. So I'm suggesting to Mr.McMahon another match to gain control for another year. If he can cause right now he's caught up with DX. So will have to wait to see when that happens. Nerdy Tom: Good Stuff! There you have AWWE will be back soon. Save is out and Gamer is ready to take out the Corp. See you guys on the road to Summerslam! More Images To Get you hyped up and make it so you can't wait till release! Massive News On SVR10:The Rock Now Confirmed News keeps coming it. The Rock has now been confirmed via Play.com in the UK. Another one of the Articles I posted at the blogspot antdagamer.blogspot.com news will come there first then I'll move it to AWWE Universe. Stone Cold looks to be coming back to the AWWE one day! Stone Cold basically confirmed as Exclusive Gamestop Preorder DLC. This is a sure bet that Austin is in as least as a Gamestop exclusive. Some people are thing Austin will be in the game as an actual wrestler that is yet to be confirmed. THQ pull a dlc code with UFC and made Bader and Escudero non shareable like a normal cheat would be. So get your preorders up I think this will be the same way. The best-selling fighting videogame franchise returns to the virtual ring with the most authentic, entertaining and portable simulation of WWE programming to date. Featuring innovative new gameplay controls, an engaging Story Mode and an extensive array of unlockable content, WWE SmackDown vs. Raw 2010 delivers a compelling experience unique to the Nintendo DS. It’s your world now. NEW GAMEPLAY CONTROLS – Streamlined controls take advantage of the DS directional pad, eliminating use of the stylus. In addition, a brand new reversal system is now handled through simple button commands. COLLECTIBLE CARD SYSTEM – Earn a variety of collectible cards through winning matches and completing objectives in both Play and Story Mode. These cards, which can be traded wirelessly with other players, provide in-game power-ups, arenas, Superstar profiles and more. STORY MODE – Take created Superstars on a journey through all three brands, earning new moves and customization parts along the way. Experience story-driven action, training mini-games, cut scenes and extensive interaction with Superstars and Divas. BACKSTAGE BRAWLS – Take the action outside the ring in 14 unique areas, including parking lots, locker rooms and more. Unlock the areas by successfully completing various achievements in Story Mode. AMBULANCE MATCH – A new addition to the franchise, Superstars will attempt to lock their opponents in an ambulance to win the match. First News Detailed News Of SVR10 from Gamespot! If creativity is your thing, WWE SmackDown! vs. Raw 2010 has got you covered. More than covered, in fact. From top to bottom, the creation tools in THQ's upcoming wrestling game have been either overhauled, upgraded, or, in some cases, re-made from the ground up. The result will be a game that is more open-ended and flexible than ever before. Recently, THQ producers visited GameSpot HQ to give us an exclusive first look at the new modes in SmackDown! 2010, which is the 11th game in the long-running wrestling series. After watching the demo and getting the briefest of tastes of what the new creation tools will allow you to do in the game, we can't wait to see what people come up with. While existing features like create-a-wrestler and create-a-finisher have received important upgrades, the big news for creative types will be the design-a-story mode. Using what looks to be a flexible set of tools, you'll be able to unleash your inner Vince McMahon (or, if you're evil, your inner Vince Russo) and design broadcasts of RAW, SmackDown, and ECW from the ground up. This is much more than just an extension of GM mode from a few years ago--you'll have control of everything: matches that appear in your show, backstage fights, interviews galore, and even the words each Superstar speaks will be from your specific script. Using a variety of preset choices that you can edit to your heart's content, you can create scenarios that will make up your individual weekly show. Create a slow-building feud between two Superstars; build a love story between your created wrestler and your favorite WWE Diva; or go completely nuts and feature an entire show that is nothing but Triple H screaming nursery rhymes at the crowd from the middle of the ring. It's up to you. When setting up a show, you'll have the choice to create either a scene or a match. Creating a match is straightforward--you'll be able to choose from any of the available match types in the game, set the competitors, and set any specific win conditions. Creating scenes takes a bit more work, and you'll have complete control over the scene, including the setting which can include backstage antics with exploding cars, to more traditional sequences featuring interviews between WWE announcers and talent. There's even a luminous white background that looks like something out of a hallucination, perfect for creating a dreamscape for your favorite sleepy Superstar. Once you've got a setting and some general action points added in (in one backstage scene, for example, you can cause the star of the scene to get hit by a speeding car), you'll have the ability to add text to your scene, which will appear on the bottom of the screen. There's a character limit you'll need to be mindful of, but from what we saw, there's plenty of room to get a decent amount of back and forth going. Reading text instead of hearing the voices of the wrestlers feels a bit retro, but considering that you can write anything you want, the novelty factor probably outweighs the lack of voice acting. While you can choose from anyone on the SVR 2010 roster to star in your original stories, why not use a Superstar of your own creation? Create-a-wrestler is nothing new in the SmackDown series, but like so many of the creation tools in this year's game, it has been expanded and improved into something better. There's a ton of new fully 3D-modeled apparel for your wrestler--no more painted-on ties or shirts, for example. If you put a robe or jacket on your created star, the fabric will move realistically. There's also plenty of variety--just in headgear alone we saw everything from traditional luchadore masks to eyeless hoods, samurai headgear, and even a giant chicken head. All of it looks like great fun to experiment with, but to our eyes, the best feature of the "new" CAW was the speedy menus; the developers at Yuke's have spent time on improving the loading time in screens--so the long delays while waiting for parts to load up in the CAW menu look to be a thing of the past. For existing WWE Superstars, there's a "Superstar Threads" tool to customize their outfits--such as changing up the colors of Rey Mysterio Jr.'s masks and ring attire to something completely of your choosing. Create-a-finisher, introduced in last year's game, has seen its own share of improvements. THQ producers told us there is about 30 percent more content in the standard front grapple finishers, as well as an entirely new category of finishers, this time from the top rope. As with the standard finishers, you create your top-rope finisher by stringing together a bunch of separate animations, the taunt you use to start things off, the dismount off the top rope, any flips or kicks you perform in the air, and finally your crunching landing on the mat. You can even make minor adjustments to animation speed and jump trajectory to create just the kind of move you're looking for. Enveloping all of these enhanced creation modes is the idea of sharing online. Anything you create in SVR 2010--be it your favorite create-a-wrestler, your insane top-rope finishing move, or your epic series of RAW episodes--will be able to be uploaded and shared with the online world. You will be able to rate content you download too, allowing the best content (and its respective creators) to rise to the top--and you'll be able to add tags to your creations for easy browsing purposes. In essence, THQ is blowing out online content and every SmackDown fan is a potential contributor. Elsewhere in the game, the developers are throwing a bone to players who might have been away from the SmackDown series for a while with an interactive tutorial that will provide a primer of sorts for the sometimes complex controls that are part of the game. You can use whomever you want in the ring, and you can choose to play either solo or against a friend. As you move around the ring, pop-ups will appear onscreen with instructions on how to pull off different context-sensitive maneuvers--for instance, which types of moves will be available to you in a front grapple or what you can do when moving on the apron. In all, there are more than 100 training tips available, and you can choose to play the tutorial with several AI settings--including the AI turned completely off, if you like. When in the ring, you can expect to see a back-to-basics approach in terms of presentation. The game's sometimes cluttered HUD from previous years has been stripped down. Gone are the health meter and location-specific damage meters that sat in the upper corners of the screen. Instead, the game is focusing much more on the body language of the wrestlers to convey their relative health. The only HUD elements that will remain are a small halo appearing underneath each wrestler that acts as a momentum meter, and the occasional reversal timing indicator that will pop onscreen above the wrestlers' heads. Speaking of reversals, the reversal system has been tweaked for SVR 2010 as well. Previous games had separate buttons for strike and grapple reverses--this year that's whittled down to a single reversal button, which should simplify the process. The timing of reversals--or, more accurately, the length of a reversal window--has been tweaked as well in order to prevent reversals from becoming too easy to execute. Other control changes include a new pinfall kickout system borrowed from THQ's Legends of WrestleMania game (which requires you to fill up a meter in order to kick out of a pin), a load of new moves available to players when standing on the apron (such as Triple H yanking people into the ring, or Rey Mysterio Jr. performing a springboard leap into the ring), four "strong" grapple holds available to players (up from two in last year's game)--collar and elbow, side headlock, wrist lock, and rear waste lock, each of which triggers a different set moves. In addition, you'll be able to manually transition between grapples by holding down the right bumper and moving the right stick. In keeping with the game's customization theme, it will be easy to record your own match highlights this time around. At the end of a match, you'll be able to see a list of defining moments in the match you just completed. You can choose to rewatch any of these defining moments--anything from bloodying your opponent to sending him (or her) through a stack of tables--and save them for later use. Last year's Road to WrestleMania mode returns this year with six brand-new stories from around the WWE stable of wrestlers. This time around, there will be a Diva-centric storyline, as well as a story specifically meant to focus on your created wrestler, which is all the more reason to bust out that giant chicken head for your created grappler. In addition to seeing the Xbox 360 version of the game, we got a chance to check out the Wii and Nintendo DS versions of SVR 2010. On the Wii, the frenetic pace and motion-based gameplay of last year's game have been nearly completely jettisoned this time around in favor of a more realistic game speed and a control scheme that more closely resembles that found in the Xbox 360 and PlayStation 3 versions of the game. In fact, producers told us that the goal was to make the Wii version as comparable to the other versions of the game as possible. As a result, SVR 2010 for the Wii will have a feature set that is virtually identical to the other versions, including the extensive creation options like create-a-finisher, the upgraded create-a-wrestler, and the all-new story designer. The controls in the Wii version will be more button-centric than ever before--and the aforementioned motion controls have been largely done away with, mainly because they were so unpredictable in the previous game. That said, you'll have lots of options for control--including the default Wii Remote and Nunchuk, as well as alternate control schemes using the GameCube controller or the Wii Classic Controller. This screenshot comes from the Wii version of the game. THQ is still searching for an ideal DS solution for the SmackDown series, and this year represents another experiment. Game speed has been upped from previous games, and in the ring, the gameplay takes place from an elevated camera, with a perspective that is almost top-down. Unlike previous games, which used the touch screen almost exclusively, this year's game on the DS will use buttons to control the action in the ring. The big addition for the DS version will be a collectible card system. You'll earn cards in season mode, either by winning matches or by doing favors for WWE Superstars you'll encounter along the way, and you'll have a deck of cards to choose from before a match. You'll go into a match with a handful of cards and can activate them in the match, like run-ins from other wrestlers, or for specialized boosts that will make your grapples temporarily unblockable. In addition to the match boost cards, you'll earn cards that will unlock goodies like new match types, create-a-wrestler parts, and more. The DS version will also have a story mode that will have you interacting with WWE Superstars, and even Vince McMahon himself. The 12-chapter story will be semi-open-ended, allowing you to travel across multiple locales, such as the gym (where you can train your created character to improve his or her stats), the hospital (where you can nurse your wounds), and Mr. McMahon's office (where you can be berated by the boss). Of course, you'll be wrestling in tons of matches as well, as you play through a storyline that is sure to have plenty of double-crosses, body slams, and, presumably, lots and lots of exclamation marks. As much as we've revealed today for WWE SmackDown! vs. 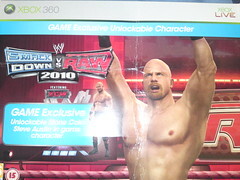 Raw 2010, there are still lots more surprises to come for the game. GameSpot will be on top of all the latest developments in the coming months, leading up to the game's release on October 20. Check out additional screenshots of WWE SmackDown! vs. Raw 2010: 360-PS3, Wii, DS. What a night last night and now the AWWE is DXless lol. Even though the guys was getting alone I guess HBK knew that ONS could of been his last night and he decided to go out in DX attire after seeing his former friend HHH burned at the hands of Regal, I guess he knew anything is possible in AWWE. Expect The Unexpected. We take a look back at this increadible match from the Austin & Lashley Era. It was a long time ago I can't believe we been doing this so long. Anyways. These guys put the Unexpected in the AWWE. Also look for Lashley to join the Hall Of Fame Soon.